10,8% of the Dutch online jobs posted by employers, is in English. This is shown by figures from Jobfeed , Textkernel’s labour market analysis tool that gathered statistics on Dutch online jobs written in English. Looking at jobs posted by intermediaries, only 6,8% is in English. Most Dutch jobs in English are found in North Holland. While North Holland has 20% of all Dutch jobs, no less then 30% of all jobs published in English are in this province (Source: Jobfeed Q3 analysis 2014). Regarding the share of English jobs per province, North Holland has the largest share with 13% of all jobs in that region published in English. North Holland is followed by South Holland (7%), North Brabant (7%), Limburg (6%) and Utrecht (5%). Whether a job is published in English, differs per profession class. 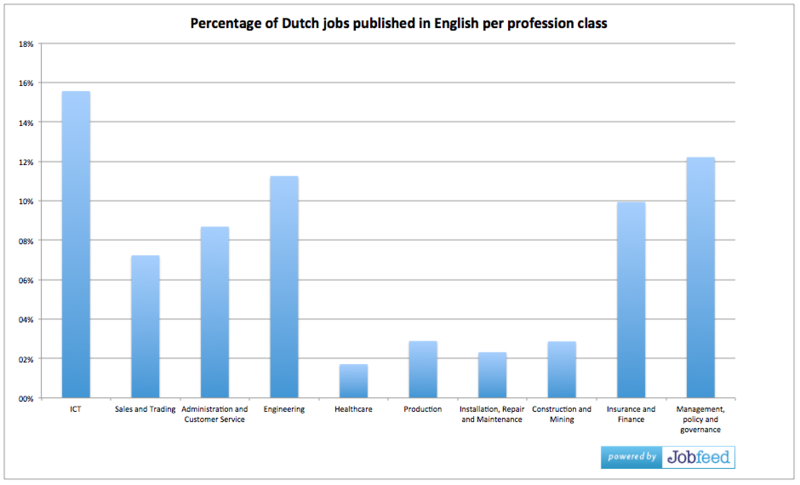 The graph below shows that of the ten largest profession classes, IT has the largest share of English jobs. 15,6% of all IT jobs are written in English. On the other hand, only 2% of Healthcare jobs were published in English. Numbers come from Jobfeed, the labour market analysis tool of Textkernel, that collects and categorises all online jobs and makes them searchable. For this analysis 5,4 million Dutch job ads, posted between 1 January and 31 October 2014 have been analysed, categorised and deduplicated, of which 1,1 million unique jobs remained. For more information on this or other labour market analyses, send an email to press@jobfeed.com.